You can get a close-up of many parts of the world that have seen dramatic changes due to the world's rising temperatures. With world leaders gathering to talk climate change at the COP21 Conference in Paris this week, Google thought it was time for an object lesson. The Google Maps blog highlighted several locations around the globe where you can see the impacts of climate change thanks to the Street View capabilities in Maps. These particular settings were made possible through the Street View Trekker, a backpack that’s loaded up with a 360-degree camera. The highlights include a Polar bear on the edge of Hudson Bay, which must deal with a lack of ice. Scientists are also using the Street View Trekker to monitor the health of blue oak trees, which are threatened due to drought and rising temperatures. 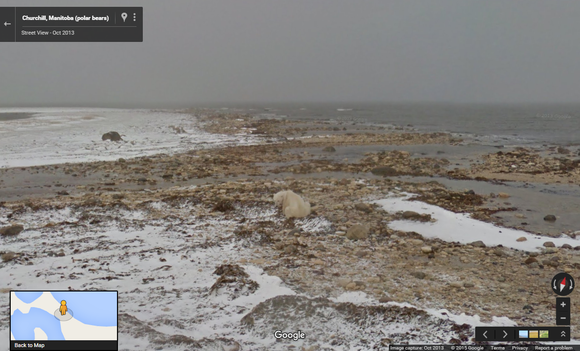 Street View captured Polar Bears at the edge of Hudson Bay. Head to Google Maps to check such other spots around the world that need more attention, or grab the Street View app for Android and iOS. Why this matters: Google’s Street View Trekker allows for Google Maps to stretch into places where vehicles can’t go. Along with feeding the curiosity of those who like the idea of exploring the globe, Street View can be especially helpful in education where students can get a much closer look at the world. Along with all the new field trips you can take in Google Cardboard, there’s plenty to keep your eyes busy.